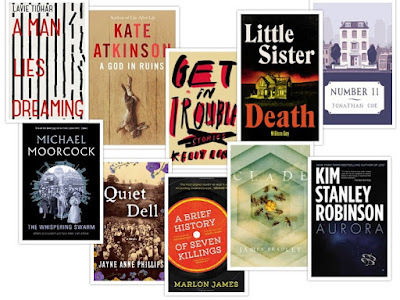 A short-story collection and nine novels published this year that I enjoyed reading. Looking back, I realise that I haven't read much new science fiction, apart from short stories. I need to catch up. Three non-fiction books I especially liked were: Oliver Morton's history of climate change and geoengineering, The Planet Remade; Luc Sante's chronicle of the old, tough City of Lights, The Other Paris, and Owen Hatherley's tour of Eastern Europe and its architecture, Landscapes of Communism. The western end of London Wall is a forbidding entry to the City of London. Brick and concrete, glass and steel buildings rise ten, twenty, thirty stories high in an elephantine fortification. One building, faced with panels the colour of Elastoplast, straddles the four-lane road, with a branch of Pizza Express suspended in its arch. Giant foghorns painted red and blue cluster in front of another. But off to one side, in the lee of the Museum of London, is a small open space where a few stretches of the old wall of London still stand. Medieval brick and stone built on Roman foundations. In an embayment there's a neatly planted herb garden, maybe three metres long and a metre across, the green shoots of narcissi showing in this warm December. And a desire path has been trampled by human feet across the grass, swerving around a bulwark as it angles towards the rectangular ponds at the rear of the Barbican. I was there to visit the Museum of London's Crime Museum Uncovered exhibition. From which you learn that most murders don't involve unraveling clues left by meglomaniacs to taunt the police, but are manhunts for men whose violent chaotic lives have fatally intersected with their victims. 'Luckily for us, most criminals are stupid -- that's why they're criminals,' a Portland, Oregon cop once observed to me, when I accompanied him on a ride-along. One of the exhibits was what looked like a pair of child's stilts, constructed by a Victorian burglar to make fake footprints to mislead the police. He was convicted because the prints of his own shoes were found next to his false trail.